Indiana is one of the knife-friendliest states. Switchblades and almost all other knives are legal here. Only ballistic knives and throwing stars are illegal or banned in Indiana. As it is mentioned above, only ballistic knives and ninja throwing stars are illegal as well as banned in Indiana. The code 35-47-5-2 explains the illegality of the Ballistic knives. So, manufacturing, possessing, displaying, offering, selling, lending or purchasing knives with detachable blades that are ballistic knives is a class B misdemeanor. The code 35-47-5-12 explains the illegality of the ninja throwing stars. A Chinese throwing star commits a Class C misdemeanor. Same here, manufacturing, importing, selling, lending or anything related to throwing stars or throwing knives is a class C misdemeanor. It is a class B misdemeanor if someone sells, gives or delivers any dangerous/deadly weapon/knife to a person who is intoxicated or knowing him to be in the case of intoxication, or having the habits of becoming intoxicated and related to it. The details are given in the code 35-47-4-1 below. 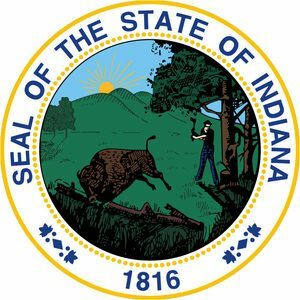 There are no concealment issues in Indiana knife laws. Open carry knife laws and concealed carry knife laws are the same. And you cannot carry an illegal knife openly or concealed. Blade size for particular knives is not an issue in Indiana knife laws too. There is no fixed or restricted blade size for any particular knife. You can carry any legal knives with any blade size. Anyone cannot sell, give or transfer any deadly/dangerous weapons or knives to any person under eighteen (18) years of age. A person under eighteen (18) years old can possess a dangerous knife if only he/she has the permit from the parent/guardian. The code 35-47-2-7 says about the law of the minor. Indiana does not allow any dangerous or deadly weapons/knives such as dirks, daggers, stilettos, knives consisting of a sharp-edged or sharp-pointed blade in the school campus, school bus or any places that belong to any school. If anyone intentionally possesses a knife on school premises, commits a Class B misdemeanor. If the knives are provided to the person by the school authority. If the person uses the knives for an authorized reason given by the school corporation. If the knives are secured/kept in a vehicle. The code 35-47-5-2.5 explains it. commits a Class B misdemeanor. However, the offense is a Class A misdemeanor if the person has a previous unrelated conviction under this section and a Level 6 felony if the offense results in bodily injury to another person. Other than the ballistic knives and throwing stars, all other knives are legal to carry and own in Indiana. Butterfly or Balisong knives are legal. Switchblades and all other automatic knives and gravity knives are legal. Indiana’s knife laws are not that strict like the previous ones. Restrictions for the minors under eighteen years old and restrictions for carrying any knives in the school premises are two important factors.